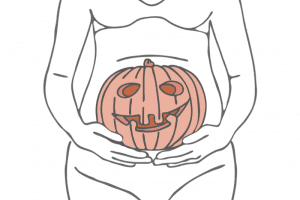 Even when you are pregnant, you can still celebrate Halloween with a fun costume. Turn your growing belly into a part of your ensemble to create a simple but unique getup everyone will be talking about! Gumball Machine: Take advantage of your shape by gluing colorful pom-poms to a white shirt to make a gumball machine. Zombie and Baby: This option is a classic for a reason. If you love spooky costumes, dress like a zombie and use a plastic baby doll poking through your shirt to look like a zombie baby. Golfer and a Hole in One:This couple’s costume involves your partner dressing like a golfer and you wearing a green dress with a DIY hole in one symbol. Redneck:Your pregnant belly can easily turn into a beer belly in this gender-bent costume. Draw on a mustache and wear beat-up clothes with a baseball cap. Peanut M&M: This easy costume just requires wearing a colored T-shirt with a white M and a cute little peanut design on your belly. Fried Egg: For this costume, you need nothing more than a white dress with a yellow circle. Family members can dress up as bacon, pancakes and other breakfast foods. Basketball player: Paint your belly like a basketball, and wear it peeking out through a pulled-up basketball jersey. Octopus: Wear a shirt decorated with a friendly face over your bump and a tutu with eight legs to look like a sea creature. Solar System: Wear a shirt decorated with a sun over your belly and hang balls representing the planets off your arms. Alien Baby: Attach a plastic alien figurine and some blood splatter to a plain shirt to recreate the chest-burster scene from this classic movie. Kangaroo Mom: Dress like a kangaroo and stick a little stuffed joey in your pouch. Padme and Anakin: Star Wars fans can dress up like the pregnant Padme Amidala and have their partner wear an Anakin Skywalker costume. Mother Earth: Paint your belly like a globe and wrap a white toga around your body. Complete the look with a flower crown. Prego Jar: Make a fun play on words by dressing up like a jar of Prego pasta sauce. Kool-Aid Man: Wear a shirt with the Kool-Aid man, and hang a broken brick wall made from cardboard over your shoulders. Juno and Paulie: Dress like the pregnant character from this cult classic by wearing a striped shirt and a skirt over jeans. If possible, get your partner to dress up in track shorts and a headband. Pumpkin Patch: If you like to show off your belly, paint it to look like a pumpkin and wear a green crop top and leggings to complete the look. Winnie the Pooh: Turn your belly into the adorable yellow tummy that pokes out of the signature cartoon bear’s shirt. Avocado: For this easy and fun costume, turn a big piece of cardboard into a sliced avocado, and leave a hole for your belly to look like the seed. Bowling Ball and Bowler: This easy DIY couple’s costume for Halloween just requires you to paint a shirt to look like a bowling ball while your partner wears a colorful bowling shirt and shoes.